Version 2.0.0.0 requires write access for new features so if you are upgrading from an older version please logout and login again to WStack. Verion 2.0.0.0 is now live. WStack provides a quick access to Stack Exchange sites. Login to your Stack Exchange account. View your Stack Exchange messages, notifications and network activity. View your stats on each of your sites. Search questions and view answers. Search for users and view their profiles. Search for tags and badges. Periodically check for inbox items and notifications. 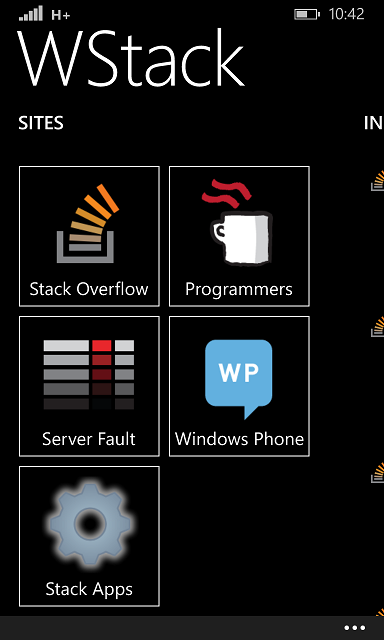 You can download WStack from Windows Phone Store. Browse other questions tagged app windows-phone .